After the 2008 economic crisis, there are many people in Catalonia who find it difficult to go to the theatre or visit an exhibition, due to personal circumstances or health issues. Apropa Cultura is a publicly funded programme that aims to eliminate such barriers and improve access to Catalan cultural settings. Apropa Cultura has been building up, since 2006, a network of cultural programmers and social intervention agencies. Thanks to a user-friendly web portal programmed with Drupal, it supports participation through the dissemination of information to partners, the provision of tickets at discounted prices (0-3€), and the organization of training for social educators. Apropa Cultura is a successful bottom-up initiative that has effectively translated the rhetoric of democratisation of culture into an operative programme with deep social impact. After the 2008 economic crisis, several European public administrations and funding bodies responded to the situation by focusing on social inclusion. Barcelona, iconic capital of Catalonia, also devoted efforts to the same end. For instance, the “Barcelona Social Inclusion Plan 2012-15” was designed to reach marginalised groups with health, disability, integration, ageing, housing, or poverty issues. Culture was also included in this strategy, thanks to the “Strategic Plan for Culture 2011-21”. The plan had the general aim of democratizing culture and recognized the double dimension of culture as an element of economic development and as a key into social cohesion and cultural rights. To that end, it sought to establish a framework to help bridge the gap between cultural institutions and disadvantaged audiences. One of the initiatives that were included under this umbrella is “Apropa Cultura”, which means “bring culture closer”. Apropa Cultura is an online meeting point for cultural and social institutions. On the one hand, there are theatres, concert halls, festivals and museums of Catalonia (over 90 cultural public and privately-owned resources) that offer some of their tickets at a reduced price. On the other hand, there are social entities that can book tickets for performances and activities so that the people they care for (e.g., elder citizens, people suffering from addictions, the prison population) can make the most of such cultural and social events. Fig. 1. Home page of Apropa Cultura . There are many people who find it difficult to go to the theatre or visit an exhibition, due to personal circumstances or health issues. Apropa Cultura is a publicly funded programme that aims to eliminate such barriers and improve access to Catalan cultural settings. Apropa Cultura has been building up, since 2006, a network of cultural programmers and social intervention agencies. It supports participation through the dissemination of information to partners, the provision of tickets at discounted prices (0-3€), and the organization of training for social educators. In the case of Cultural Heritage, museums and cultural centres propose visits and workshops around their collections and exhibitions. These activities are adapted to the needs of each group. The main targeted social sectors are: people with intellectual and physical disabilities; people with social issues arising from mental illness; victims of gender violence; seniors with problems of isolation; the prison population; immigrants; children and adolescents at risk; people suffering from drugs or other addictions; and homeless people. ⦁ The cultural institutions adhere to the programme and offer their tickets and visits at a reduced price of 0-3€. ⦁ The cultural institutions upload their programme to the website. ⦁ The social entities register in the website and are validated by the Apropa Cultura team. ⦁ The social entities consult the programmes and book the performance or visit. ⦁ The people under the social entities’ care enjoy the outing (Fig. 2) and then the experience is evaluated through a form. The Apropa Cultura website is a multifaceted marketplace developed in Drupal (https://www.drupal.org/) that includes a request and allocation environment, a management environment, a public part (with information), and a CRM. The request and allocation are based on complex algorithms to ensure the allocation of tickets and activities is as fair as possible. This management platform was developed by Òmada (http://www.omada.es/ca/), a company based in Barcelona that specializes in website development, digital management, and online marketing. While the Apropa Cultura portal is the main visible face, the project goes beyond this online resource. Firstly, Apropa Cultura tries to ensure that all cultural facilities offer at least 2% of their regular programming to groups at risk of social exclusion. 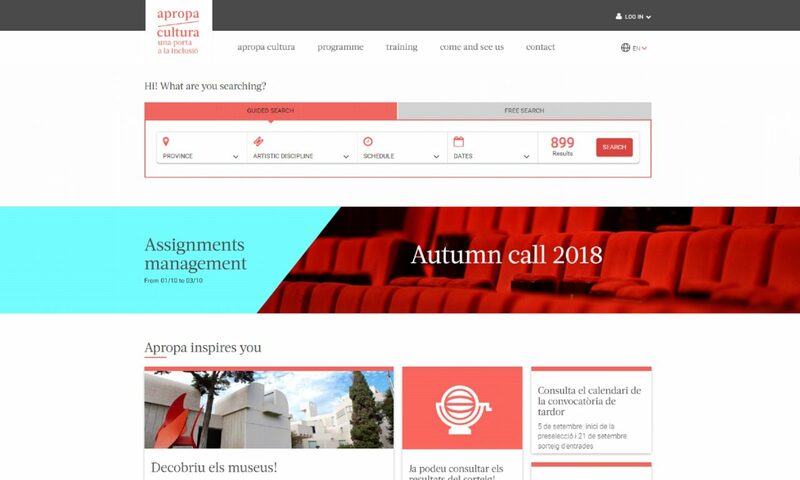 To that end, Apropa Cultura offers to cultural institutions a continuous support service regarding issues related to cultural organisation, content creation, and web management. Secondly, Apropa Cultura needs to ensure that the activities proposed by cultural institutions are a success. To that end, the project organizes periodic sessions with social entities to present the programme, help them make the best choice, and therefore guarantee that the maximum number possible of people sign up for the different activities. Thirdly, they organize training activities tailored to both types of stakeholders. On the one hand, there are workshops related to the arts for professionals belonging to the social entities. On the other hand, there are workshops about accessibility and inclusion for professionals belonging to the cultural facilities. All sessions are recorded, edited, and uploaded to the Apropa Cultura Youtube Chanel (www.youtube.com/apropacultura). 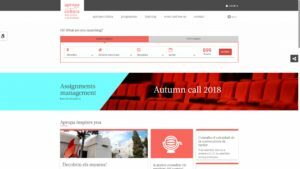 Seemingly, pedagogical dossiers containing a summary of the training sessions, as well as resources for further development, are uploaded to the Apropa Cultura website (http://apropacultura.cat/formacio-mediateca.aspx). Fourthly, Apropa Cultura offers to cultural facilities the possibility of receiving a personalized advice service so that they can design or adapt their activities to the needs of groups with social and personal diversity. One very successful example is the training course “Learning with Art”. Each session is designed together with the educational services of the cultural equipment where it will be developed. Apropa Cultura deals with the dissemination and registration of attendees. As previously said, all sessions, as well as the pedagogical dossiers, are uploaded to the website to guarantee an open access. Finally, Apropa Cultural organizes seminars on accessibility and inclusion, aimed at professionals who work in cultural facilities. The goal of these events is to publicize the social world, the different groups involved in it, and their characteristics, as well as to share experiences of artistic and social projects and good practices from other institutions. The project’s roots can be traced back to the early 2000s at a specific venue, L’Auditori de Barcelona (the Barcelona Concert Hall), which set out to promote inclusiveness for its music performances. This successful initiative triggered the attention of other cultural institutions, which subsequently joined in. In 2007, the regional government of Catalonia included the project in its own structure of public policy. Until 2009, several social entities showed a great interest in the concerts that L’Auditori scheduled during these years. The project “Auditori Apropa” was set up in response to this concern. Yet, this project was soon too small because the desire of social entities to access the cultural offer was no longer sporadic. It was a reality, increasing year by year. In 2010, Apropa Cultura was set up. Apart from music, it also included theatre and dance, thanks to the participation of three major performance centres in Barcelona: Teatre Nacional de Catalunya, Mercat de les Flors, and Teatre Lliure. 2012-2015 are years marked by territorial expansion and diversification in activities. During the 2012/13 season, new centres from around Catalonia joined the network. A year later, several museums began to offer their programmes through Apropa Cultura. From 2016 until now, the offer keeps growing. The most important aspect is that Apropa Cultura incorporates also some private institutions, such as “Obra Social La Caixa”, a social foundation of Caixa Bank, the major Catalan bank. As of July 2018, Apropa Cultura has reached more than 100 theatres, auditoriums, festivals, museums, and singular spaces. Cultural Heritage settings, such as the Museum of Contemporary Art of Barcelona (MACBA), the Picasso Museum, and the National Museum of Art of Catalonia (MNAC), started adhering to the programme since 2013. A major turning point was 2016, when the Culture Institute of Barcelona (belonging to the City Council) joined the network and brought along 6 museums. 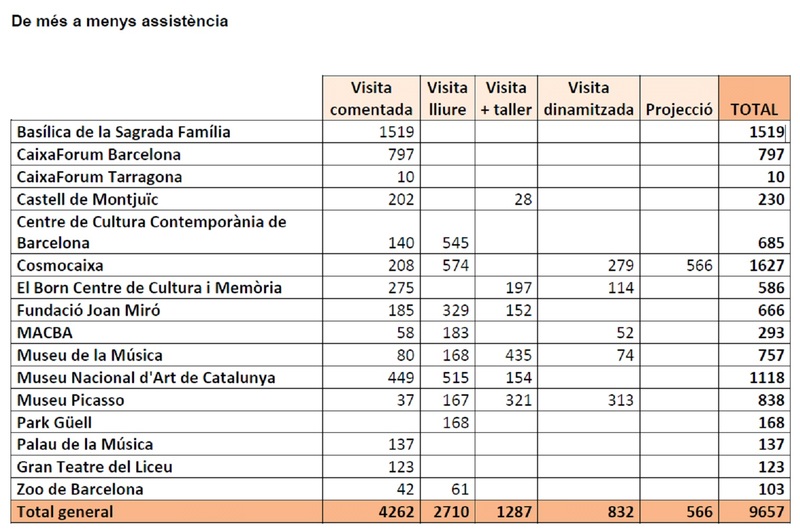 The season 2016/2017 is marked by the overall participation of 18 museums and unique spaces in Barcelona, 2 in Girona, 1 in Tarragona, and 2 in Lleida (these cities are the capitals of the four Catalan provinces). Social centres can request visits to exhibitions and participatory activities at any time of the year and receive personalized attention by the equipment. Although not funding directly Apropa Cultura, cultural institutions contribute to the functioning of the initiative by financing discounted tickets (€150,000 to €200,000 per year). In terms of sustainability, this service does not require substantial amounts of money, and access to funding is easily facilitated since the Apropa Cultura initiative is justified and driven by social purposes and perspectives: the initiative can therefore attract contributions from private companies wishing to fulfil their corporate social responsibility. At present, around 1,800 social entities and services in Catalonia are registered in the programme. 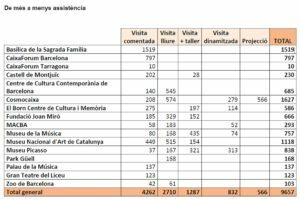 Thanks to this, people they care for can enjoy the cultural offer (around 1400 activities) of more than 90 cultural facilities (including theatres, auditoriums, singular spaces, festivals, and museums) in more than 170 municipalities around Catalonia. Since 2013, the number of cultural heritage settings has been steadily growing every year. Correspondingly, so have the visits associated to social institutions. 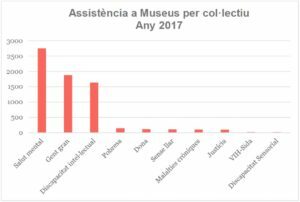 During 2017, there have been 9,657 experiences in museums of people attended by social entities. The majority correspond to guided visits, followed by free visits, visit + workshop, dynamic tours, and audio-visual projections (Fig 3). Fig. 3. 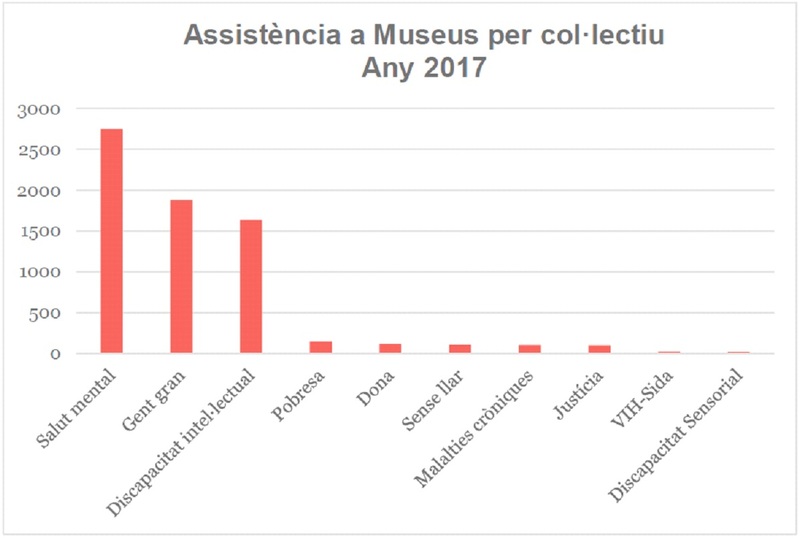 Attendance to museum settings in 2017 ordered by type of visit. Retrieved from . The majority of visits corresponded to groups with mental health issues, followed by elder citizens, people with mental disabilities, people under the poverty threshold, victims of gender violence, homeless people, people afflicted by chronic illnesses, prison inmates, people affected by VIH, and finally people with sensory disabilities (Fig. 4). Fig. 4. Attendance to museum settings in 2017 ordered by type of social group. Retrieved from . “We have the opportunity to rediscover our ability to enjoy and be moved by art and culture”. Elena Martínez, Social worker at the SRC of Rubí, Castellbisbal and Sant Cugat"
“Outings with people from the centre help me to establish closer working relationships and strengthen feelings of trust”. Iban Seguer, Social Educator at CRI Can Planas"
“We all do one thing that makes sense: we open doors to unknown worlds”. Salvador Sunyer, Director of the Temporada Alta Festival"
"It makes me feel very good about going out with other women. It gives me a lot of autonomy”. Marta, 63 years old, Noestasola (Elder citizens)"
“I feel accomplished, I feel as another spectator. For many years I could not go to the theatre”. Rafael, 44, CAMS (Addictions)"
"It is a program that makes us feel alive when participating in cultural events". Núria, 84 years old, Occupational Center Noria (Intellectual Disabilities)"
Apropa Cultura has also been successful in promoting social awareness, enhancing the feeling of belonging, and encouraging understanding between apparently very different sectors. A fundamental factor in the first case was the decision to have a strong presence in the social media and to design a campaign in which different people (directors of cultural facilities, political figures, social educators, and patrons) summarized in one sentence what the programme meant to them. Fig. 5. Posters and magazines, elements of the Apropa Cultura marketing campaign. Retrieved from . With regard to social awareness, the programme was supported by a comprehensive marketing campaign (Fig. 5) that included flyers, pins, magazines, posters, and a promotional video presented by a known Catalan singer (https://www.youtube.com/watch?timecontinue =2&v=dCE7--GidUU). As a result, it is fairly common to hear people outside the social and cultural sectors confirm their awareness and praise the role of the Apropa Cultura programme. With regard to the feeling of belonging, a forum was established amongst social organisations to discuss their cultural experiences, whilst the initiative also gave the opportunity for cultural facilities to learn, reflect and enhance their social dimension. Additionally, a choir was also spontaneously created in 2014 by social professionals participating in training workshops. Since then they have participated in several concerts in major concert halls and events in Catalonia. Finally, the encouragement of understanding was confirmed by several professionals who had participated in the “Apropa Crossroads” events. These consist of an exchange of experiences between a social entity and an equipment. On two different days, they visit each other’s installations and participate in its daily activities so that they open their world, their values, and their realities to the other. Apropa Cultura is a highly transferable project since it is run by only 3 full-time employees, who are in charge of the coordination of the activities and the maintenance of the website . One obstacle, however, is that the costs of the cheapest tickets are assumed by the participating cultural organisations, which are already in delicate financial situations. In operational terms, the project has also faced the challenge of transforming the scale and territorial extension, to move from a successful project using specific cultural infrastructure to a much broader public policy plan . Apropa Cultura is a successful bottom-up initiative, since the practice scaled up from a specific programme limited to a single institution to an integral cultural policy involving a network of participants from various sectors. It is also remarkable in its ability to pool a diversity of actors such as social / public / cultural institutions and private stakeholders. It is an example of efficient coordination of different cultural organisations to amplify the impact of their social actions and generate common knowledge . On the other hand, Apropa Cultura has produced an increase in social organisations’ cultural attendance and participation, thus connecting two worlds which had initially little in common. 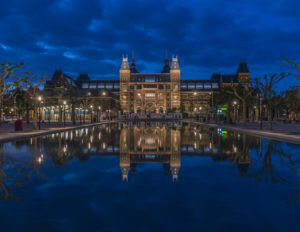 Through a network of coordinated actors, the programme not only connects social organisations and cultural institutions, but also mutually reinforces their understanding of each other . The programme is a case of excellence because it successfully translated the rhetoric of democratisation of culture and reaching groups at risk of exclusion into an effective programme of coordination that involves the full collaboration of social centres and cultural facilities . We would like to express our gratefulness to Marc Hernández, former Project Manager of Apropa Cultura and to Claudia Torner, Coordinator of Apropa Cultura. Apropa Cultura (2015), Apropa Cultura: Collective cultural activities. Dossier prepared for Culture For cities and regions Project 2015-2018.